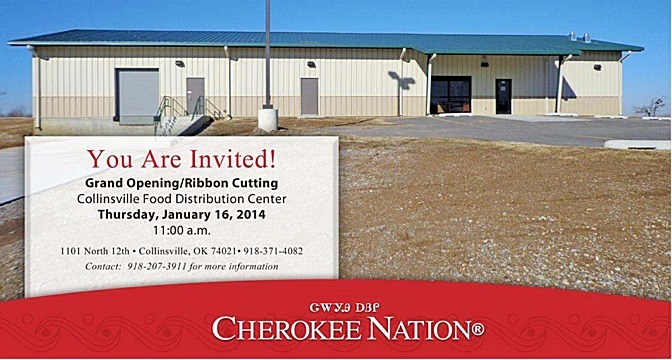 COLLINSVILLE, Okla. -- The Cherokee Nation celebrated the opening of its seventh food distribution center Thursday. A ribbon cutting was held at the new Collinsville Food Distribution Center at 1101 North 12th St. The 5,500-square-foot facility will provide more than 300 American Indian families with healthy USDA foods each month. Prior to the supermarket-style center opening, families drove to a designated area and received foods from the back of a delivery truck. "Cherokee Nation citizens in the area can now shop confortably for nutritious foods their families need," said Cherokee Nation Principal Chief Bill John Baker. "By working closely with Collinsville community leaders we were able to build this new center, which helps propel our tribe forward. These are the kinds of investments that increase program effectiveness and create a healthier Cherokee Nation." The Cherokee Nation started the first-of-its-kind food distribution program in1984, so eligible Cherokee families would have access to fresh produce, proteins, whole grains and dairy items. The tribe's Human Services family assistance department now manages seven food distribution centers and five tailgate sites within the Cherokee Nation's 14-county jurisdiction. "The opening of the Collinsville Food Distribution Center means more of our Cherokee families now have access to fully stocked shelves and a wider food selection to put on the dinner table when they need it," said Ella Sands, assistant manager of the program. In fiscal year 2013, more than 100,000 participants shopped at the Cherokee Nation food centers or tailgate sites,which provided more than $6.7 million worth of USDA foods.The Collinsville Food Distribution Center adds five new jobs to the area. It is open from 8 a.m. to 4 p.m. Tuesdays and Thursdays. For more information on the Cherokee Nation Food Distribution Program, call 918-207-3911. The Cherokee Nation is the federally recognized government of the Cherokee people and has inherent sovereign status recognized by treaty and law. The seat of the tribal governmentr is the W.W. Keeler Complex near Tahlequah, Okla., the capital of the Cherokee Nation. With more than 320,000 citizens, 9000 employees and a variety of tribal enterprises ranging from aerospace and defense contracts to entertainment venues. Cherokee Nation is one of the largest employeers in northeastern Oklahoma and the largest tribal nation in the United States. To learn more please visit www.cherokee.org. Editor's note: Find all the latest Cherokee Nation news at www.anadisgoi.com. Cara Cowan Watts, Buel Anglen, and Lee Keener have represented the Collinsville area for many years as councilmen with the Cherokee Nation. Buel is a former councilman now, but was most responsible for landing this facility in Collinsville. Cherokee Nation Principal Chief Bill John Baker greeted guests at a luncheon (following the ribbon cutting) held at the nearby Victory Cherokee Organization community center. Aline Phillips (right) received gifts in honor of her service at the VCO luncheon. Cherokee Nation Food Distribution Program is "to distribute nutritious foods from a well-balanced food package in a dignified environment while providing healthy nutrition education and food preparation to eligible Native American households residing in the jurisdictional area of the Cherokee Nation." Collinsville Food Distribution Center at 1101 North 12th St is 5,500-square-foot facility and should provide more than 300 American Indian families with healthy USDA foods each month. Collinsville is open from 8 a.m. to 4 p.m. Tuesdays and Thursdays and closed for inventory the last three working days of each month. Prior to the supermarket-style center opening, families drove to a designated area and received foods from the back of a delivery truck at nearby Victory Cherokee Organization (VCO). For more information about VCO, go to victorycherokee.org. What the Tribal news release did not share is how the Collinsville store came about after years of hard work by former Councilman Buel Anglen. Collinsville Schools received a Federal Learn and Serve grant which enabled local students to reclaim the Victory Cherokee Cemetery which is the anchor for the entire site which includes a community building built by VCO and the grocery store. After the students cleaned up the cemetery, Tulsa County Commissioner Smaligo in partnership with then Councilman Buel Anglen had the cemetery and surrounding lands returned to the Cherokee Nation. VCO built their community building in 2008 and a Tribal partnership road was built with the future grocery store and community needs in mind. Buel Anglen harassed former Chief Chad Smith until the adjacent 'Acme Brick' property was purchased, land was requested to be placed into trust and the USDA funding for the Collinsville Food Distribution Site was secured. While Buel was still in office, Councilman Lee Keener and I with Buel had to fight to keep the commitment to Collinsville and thus surrounding Rogers and Tulsa County communities. The current administration was going to let the funding return to the USDA because construction costs had risen, but your elected officials were paying attention to the meeting details and caught the budget changes. We appreciate Chief Baker following through on the commitment begun by Buel Anglen and Chad Smith as our families will benefit from better foods in safer and more secure environment. My hope is one day that Claremore or Chelsea will have the same, one day. Collinsville was truly a partnership from day one, so WADO to all of those who stepped up to make it possible. The food distribution store is open to citizens of any federally recognized tribe living within the Cherokee Nation's borders. USDA approved canned fruits, vegetables, juices, canned and frozen meats, cheese, canned and dried milk, cereals, flour, cornmeal, oil and syrup are distributed monthly according to household size. Fresh produce is available such as apples, grapefruit, oranges, carrots, onions and potatoes, as well. Eligibility includes Tribal citizenship for at least one household member, identity verification for all household members, income verification from all household members age 18 or older and residency verification. Call to verify exact documents required to apply. Income guideline changes to the federal Food Distribution Program may allow more Native American families to qualify. The rule change took effect on Oct. 1 with provisions stating the program no longer includes savings or other resource accounts when figuring income eligibility. For example, in the lower 48 states, a household of four can now have a net monthly income of $2,126 whereas before the limit was $2,081. Also, non-recurring lump sum payments and non-monthly per capita payments are excluded. Current deductions for medical expenses are also to be expanded, and a new deduction for shelter and utility expenses are established. Households may not participate in the Food Distribution Program and Supplemental Nutrition Assistance Program (SNAP), formerly known as the Food Stamp program, or other food distribution programs within the same month. Claremore Tailgate food distribution is still an option one time a month at the Community Building at 2301 N. Sioux Street. Collinsville is the closest food distribution store for Rogers County other than Salina and Nowata for some. Find me on Facebook, LinkedIn, Twitter, Google+ and Pinterest! NEW - Instragram has been added! !